God's Only Law is Love! - What the Bible says about TRUE FREE LOVE! God's Only Law is Love! -- What the Bible says about TRUE FREE LOVE! WE ARE SAVED BY FAITH IN GOD'S LOVE, HIS MERCY AND HIS GRACE AND TRUTH IN JESUS CHRIST. Therefore the Apostle James says that we who do the will or the LOVE of God now dwell under a NEW law, a PERFECT law of LIBERTY, FREEDOM from the old law. (Jam.1:25) Therefore since we do all that we do in LOVE, ALL THINGS are NOW lawful to us in LOVE, including our SEXUAL FREEDOM, as long as it is done in the unselfish, sacrificial LOVE of GOD. (1Cor.6:12; 10:23) "ALL THINGS are LAWFUL unto me." NO, WE DO NOT HAVE TO KEEP THE TEN COMMANDMENTS! For us they are NO MORE! For us they are GONE FOREVER! Thank God! We now only have to keep GOD'S LAW of LOVE, His ONLY law--LOVE! For the laws of Moses are no more to the believer in Jesus! We now only have the LAW of JESUS, God's only law, His LOVE!-A stronger law than Moses'! THEREFORE WHATSOEVER YOU DO IN THE UNSELFISH SACRIFICIAL LOVE OF JESUS IS RIGHT AND LAWFUL! Whatever you do in LOVE is the LAW--and that's ALL, that's it! God's ONLY LAW is LOVE!... Now ALL things are lawful unto us in LOVE, Praise God! As long as it's done in LOVE it keeps God's ONLY LAW of LOVE! HAVE YOU ACCEPTED GOD'S LOVE IN JESUS CHRIST AS YOUR OWN PERSONAL SAVIOUR? Do you have God's Spirit of JESUS in your heart? Do you LOVE HIM and OTHERS as much as you do YOURSELF? Do you do unto OTHERS as you would have them do unto YOU? If so, you are FREE from the old dead Mosaic Laws! Now all you must do is keep JESUS' LAW of LOVE! But it is GREATER and STRICTER even than the old Mosaic Law, because now EVERYTHING you do must be done in HIS LOVE! May God bless you with His TRUTH, FREEDOM and LOVE! Laws don't legitimize man. Laws are man's efforts to legitimize his/her morality. God's law is love and is written on every man/woman's heart so that they are without excuse. The Laws of Moses are the schoolmaster that reveals the foolishness of man. If you subscribe to the validity of the Laws of Moses you have not seen the completed work of God in your heart just yet. Don't despair, the plow is still tilling the soil. "For neither circumcision counts for anything nor uncircumcision, but keeping the commandments of God" (1 Cor 7:19). Circumcision was not a law for the Gentiles, but for the Jews. Here, Paul is saying that we must keep the commandments. The commandments still define sin, and Jesus did not remove them. He fulfilled them, meaning that we can now be perfect by his sacrifice, even when we screw up. 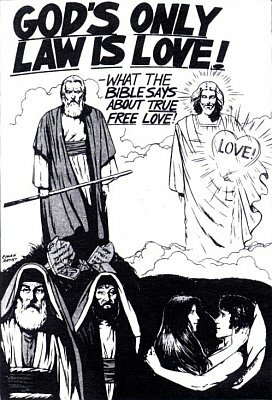 Speaking of "screwing up," what the heck do you mean by "free love?" When Jesus said "Do not think that I came to destroy the Law or the Prophets. I did not come to destroy but to fulfill,” (Matthew 5:17) he meant that the law was still in play, but it was then possible to enter Heaven because God paid the price for our salvation as he had planned. JESUS REFERENCES THE COMMANDMENTS ALL THE TIME!! In Matthew 19:4-5, Jesus reaffirms this: "He answered, ‘For this reason a man shall leave his father and be joined to his wife, and the two shall become one’." Be careful with the "free love" deal. Is Love against the Law? The Family of Love - Sin or Salvation?